It couldn’t be clearer that Joan and Sherlock don’t see eye to eye in “How The Sausage Is Made.” Other than a few brief scenes—all business, a united front in the face of the case—director Michael Pressman keeps them at deeply uneven eye lines. Sherlock peers up at Joan from halfway down a flight of stairs; a seated Joan looks coolly up at Sherlock as he hovers in a succession of doorways, practically bursting with fraught eye contact. (It’s such an uncomfortable conversation they can barely even share a frame for most of it.) The central mystery this week has very little to do with lab-grown beef; it’s about why Joan and Sherlock played Lie Chicken with one another for two days, and how little their actual conversations got to the heart of the matter. The case itself is solid enough (who doesn’t like a mystery that hinges on an FDA ruling about legally-identical meat structures? ), but most of the interest is the ways this episode avoid direct adaptation, as this show often does, and quietly steeps in canon instead. Holder and his gift are a callback to “The Adventure of the Beryl Coronet,” which centers around the potential public scandal of foul play against a priceless treasure (featuring someone refusing to give evidence against a guilty party, a criminal who gets away with it, a bold gambit to manipulate an outcome outside the strict bounds of the law, and someone who gets a little offstage comeuppance). There’s even a mention of the “Musgrave” case, reference to a story which also involves murder in the thematic vicinity of an unrelated priceless treasure. But the real priceless treasure of investigating murder is the friends we make along the way, and so the story closest to the bone (sorry) of this episode is The Hound of the Baskervilles. Canon fights between Holmes and Watson were rare, but Baskervilles has a pointed one: Watson, having accepted a role as bodyguard and solo investigator, finds out Sherlock’s been shadowing him all along, rendering his observations redundant and making him feel like a fool. Holmes deflects the worst of Watson’s anger, but it establishes Watson’s deepest ongoing sore point about Holmes. It’s one thing to be left in the dark about some of the details; it’s another to be lied to. This isn’t the first time Joan and Sherlock have had words about the things he keeps from her; it isn’t even the first time they’ve had words about, specifically, Sherlock not being where he says he’s going to be. In “For All You Know,” he practically taunted her for taking him at his word. Maybe that’s why he’s so resigned to this fight after Joan realizes he’s been lying for a month and takes it on herself to find out where he goes. Naturally, he’d seen her following him. Naturally, she knows that showing the coronet to him will force the issue. Naturally, they both wait as long as possible to actually drag it up for discussion. 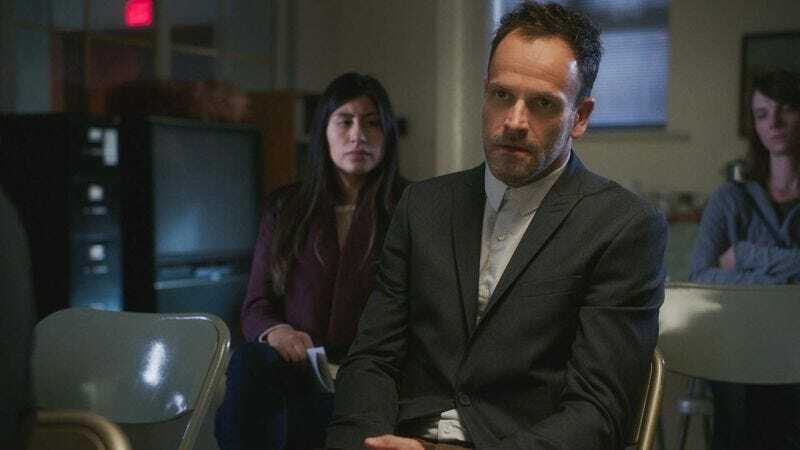 Sherlock’s recovery is a loaded subject for the show, both deliberately and by mistake (the emotional fallout of his relapse at the end of the third season had gone largely unremarked until his second one-year chip showed up last episode). It’s particularly interesting to have this brought up at a point in the season when the show’s addressing the question of Joan’s investment in “the consulting detective concern.” We know her instincts as a sober companion and mentor are still close to the surface; we also know she’s recently messed up with Shinwell, and it’s no surprise that would make her nervous about Sherlock. As a professional she’s done fairly well, but her history of helping those she’s personally close to has an almost tragic failure rate. It’s interesting that this reluctance to discuss his recovery comes so close on the heels of his breakup; at the time, he felt no desire to share his work with Fiona, but piling on a month of lies about his whereabouts is the gesture of a man who’s slowly trying to cut himself off. On some level, Sherlock knew it was a risk to stop going to meetings, or he wouldn’t have bothered to lie to Joan about it; it’s another crack in the foundation of their partnership, which has been engineered (sorry) all season to foreshadow a turning point. Even his parting wink seems more a gesture of anger than of a shared joke. It’s a challenge to her to trust him, and while he’s issued those before, there’s always been dark times ahead. The biggest success of “How The Sausage Is Made” is how much time Joan and Sherlock have to hash out their problems, and how little closure it gives them. Their schism has happened an inch at a time, but when Sherlock’s talking about peeking over the edge of an abyss, you have to wonder. Even Joan stressing the importance of participation regardless of how you feel—you show up to awards because it makes the awarders happy, and you show up to meetings because you’re all locked together in your boredom—feels like it’s pressing on a bruise rather than resolving a fight. It’s probably not a mistake that Sherlock’s resentful closing monologue so closely resembles his grim appearance at the commendation ceremony. He’s shown up, but the problems are just waiting back at home, with no easy answers and no way of getting back the inches they’ve lost. Maybe he was lying for both their sakes. “I’d invite you to come, but my plan is to stink.” Sherlock can be a joy. Oddly fond of the very low-key hired killer. I know it’s too much to hope that she comes back, but wouldn’t it be nice? Not enough incredibly relaxed and pragmatic hired killers among these Baker Street Irregulars. I’m less fond of Watson’s reaction to the religious gentlemen in the living room, which feels like it should either be a bigger moment or a different one. Not only is it far from the strangest thing she’s seen, she was forewarned in a very clear note; the show’s made much of Joan’s grace amid the unexpected, which means it’s kind of an odd beat to have her silently staring as she passes and almost not returning a “Hello.” Does she dislike religious types? Is she growing increasingly testy with Sherlock’s use of the house? Is this meaningful? Is it going somewhere? Given that it came up just last episode, I wish this episode had touched on how dropping meetings has affected Sherlock’s role as a sponsor.